I have a Holy Trinity Vigil & loads of problems in life currently - love, job-career, parent's health, job location transfer, marriage. Can anyone advise how this vigil can be used? I couldn't find much on teh website. Re: Holy Trinity Vigil Use? Its usually used as a prayer light, you pray to the Trinity. God the Father, Jesus the Son and The Holy Ghost. You can use it in conjunction with any prayer. 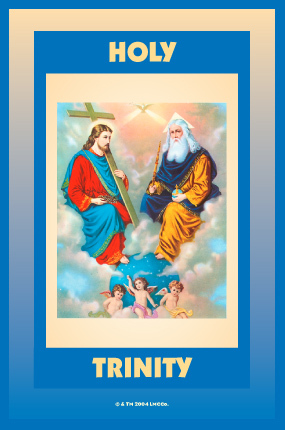 A while ago, in the thread about burning candles in triangles, nagasiva offered the suggestion to set three Holy Trinity candles in a triangle. I liked that idea and told him so. I now wish to develop this concept a little further here. Why would one burn a triangle of Holy Trinity candles? The first reason that comes to my mind would be for worship and adoration, the secondary reason that I would do this would be for seeking spiritual insight, and the tertiary reason for me would be seeking assistance and protection. What would the triangle of Holy Trinity candles look like? The triangle might be noted only by the three candles at the points, but it would not be uncommon in hoodoo to lay out a triangle of powders to mark the triangle's edges. Holy Trinity Sachet Powder would be appropriate for this. Within the triangle, it would seem natural for me to place any object to be blessed, such as a crucifix, a holy medal, a Solomonic seal, a holy card, an amulet, a statuette, a small candle representing the petitioner, or even roots and herbs dedicated for good purposes. Alternatively, a brazier of incense could be placed at the center of the triangle, containing Frankincense and Myrrh, burning on a bed of charcoal. What prayers would be said over a triangle of Holy Trinity candles? For those who are practicing Catholics or were raised in the Catholic faith, it will probably be understood that one would state one's petition and that the prayers spoken while lighting a triangle of Holy Trinity candles would be made in the three highest names -- "In the name the Father, the Son, and the Holy Ghost. Amen." My thanks to nagasiva for opening my thoughts to these possibilities. I hope they will be of help to others. I love your latest posts, thanks for sharing! I'm touched and grateful for your positive feedback! Thank you, from the bottom of my heart.